My Sys Admin Diaries : How to find the free space available in your hard disk using command line? 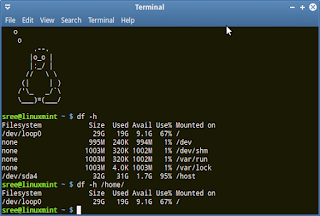 How to find the free space available in your hard disk using command line? 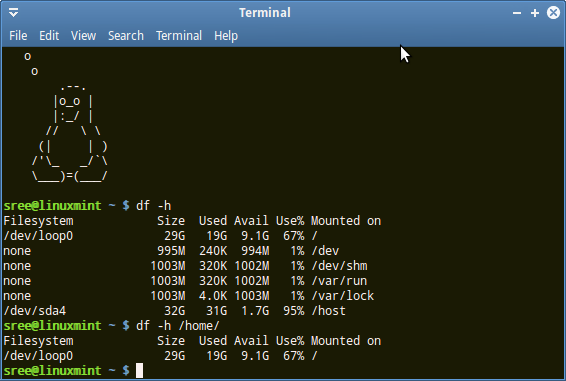 We can easily find the free space in our hard disk using command line. Command line, once we master it, is a lot easier than using Graphical User Interface(GUI), especially in linux. In linux, we have different Desktop Environment(DE) like Gnome,KDE,XFCE,Enlightenment etc which may be using different GUI based programs to find this simple free disk space. It may even change from distro to distro. So if we came from an entirely different linux distro or DE we will have to search for the specific program to view the free disk space. So what is the simplest and universal solution? Yes, it is command line which available in all the linux distros and have the same command to perform a specific task. So let's find out how find the free space using command line. Type the following command in your terminal to view the free space. It will show the total size of the partition,used hard disk space, free hard disk space and place where it is mounted on. See the below image to get the full picture. What if you want to view the free space in a particular folder? Give the path of the file/directory of which you want to find the free space. Wow ...great info. I hope it will works...Thanks and keep on sharing such information please.. Disk space can be frees by using a tool whci is diskanalyzerpro. It can free disk space in mac and windows both.